Today, researchers from several universities and government agencies released their annual prediction of the size of the Gulf Dead Zone, an area that forms at the mouths of the Mississippi and Atchafalaya Rivers and has such low amounts of oxygen that most sea life must swim away or suffocate. This year, the Dead Zone is predicted to be twice the size of the average: 10,089 mi2 – the size of Vermont. 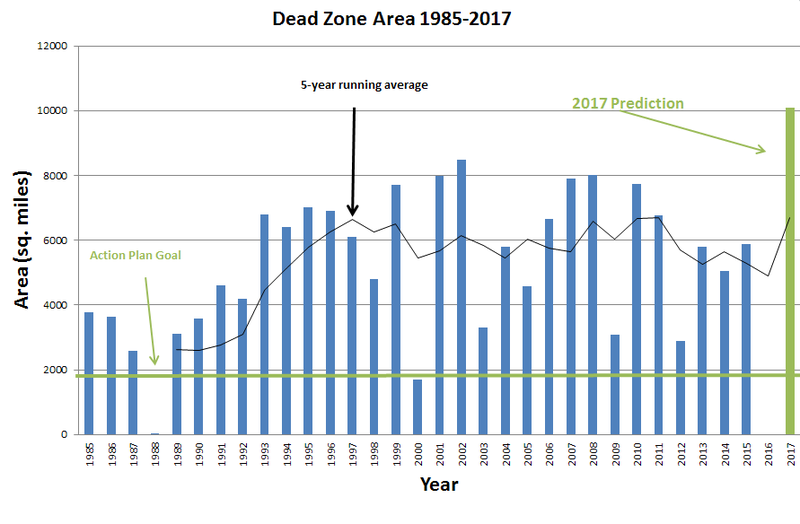 If this prediction comes to pass, it will be the largest Dead Zone we have ever seen. This prediction is disheartening, to say the least, especially in the light of the Trump Administration’s attempts to dismantle our environmental laws. We should be strengthening efforts to reduce Dead Zone-causing nitrogen and phosphorus pollution that flows into the Gulf from industrial agricultural fields, not rolling back protections. A Dead Zone that is predicted to be five times the goal of the Hypoxia Taskforce is a wake-up call. If we are going to fix the Dead Zone, we need a combination of strong pollution protections, dedicated funding, and corporate accountability. Over fifteen years ago, the Dead Zone, or Hypoxia, Task Force was formed, which includes federal and state agencies. This Task Force’s goal was to lead a path towards the reduction of the size of the Dead Zone. Sadly, while they have had many meetings, drafted three “Action Plans,” and pushed solely voluntary mechanisms to reduce Dead Zone-causing pollution, we aren’t anywhere closer to their stated goal. Their goal, which was supposed to be accomplished by 2015 and now 2035, is a Dead Zone that averages approximately 2,000 square miles.